On www.booking-on-line.com you can verify directly the and availability of ours scheduled cruises and many other services, such as hotels, transfers, typical menus... You can directly reserve online and will immediately receive via e-mail the vouchers for boarding! we provide some extraordinary departures that will soon be available on this page. • cruise along the course of the old Venetian burchielli passing in front of the gorgeous and suggestive Villa Giovanelli of Noventa Padovana; cruise to Padova with arrival to the historical 1500’s Burchiello’s Stairway at Portello, ancient river port in the historical centre of Padua, around 7.00 pm. Notes: it is possible to embark in Venice or in Malcontenta and disembark in Stra or Padua. People interested in embarking to Malcontenta must book the program Malcontenta-Padua and the meeting point with the guide is at 10.30 am in front of the gate of Villa Foscari Malcontenta, for the internal guided tour of the Villa. N.B. 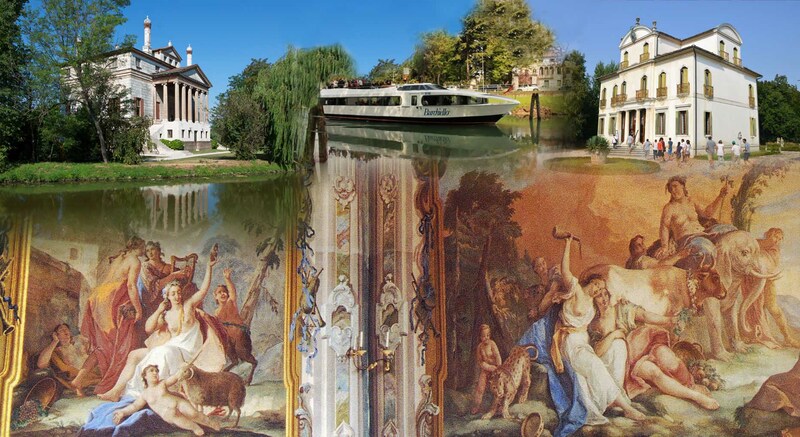 : until March 31st and after October 26th, on the routes “Venice > Padua” and “Oriago > Padua”, the boat will not stop for the visit of Villa Widmann or Villa Barchessa Valmarana in Mira. • 12.15 am: arrival in Oriago and stop for the lunch at the restaurant “Il Burchiello”; optional lunch or free time and end of services. • cruising to Venice with arrival to San Marco, Riva degli Schiavoni, on the landing stage “San Zaccaria A”, around 5.30 pm. • 1.15 pm: arrival in Oriago for lunch break to the restaurant "Il Burchiello"; optional lunch or free time; end of services. • cruising to Venice with arrival to San Marco, Riva degli Schiavoni – landstage San Zaccaria A, around 5.30 pm. The price includes: navigation, guide service and entrance fees to visited Villas. All cruises are one-way: coming back to the place of departure is always possible by using buses or trains. See the specific tour for additional information. The lunch takes place at the restaurant "Il Burchiello" in Oriago, a famous seafood restaurant of the “Buon Ricordo” circuit.. The € 23,00 “Casanova” lunch (optional) includes: a welcome starter with smoked fish carpaccio with slices of toasted bread; a plate of mix fried Adriatic fish with polenta; a side-dish of seasonal vegetables; fresh seasonal fruit salad with ice-cream; 1/4 liter wine and 1/2 liter mineral water. - The fish menu includes: a welcome starter with smoked fish carpaccio with slices of toasted bread; linguine with seafood; mixed grilled fish made up of salmon, gilthead seabream’s fillet and shrimp; a side-dish of seasonal vegetables; fresh seasonal fruit salad with ice-cream; 1/4 liter wine and 1/2 liter mineral water. - The meat menu includes: a welcome starter with sliced dried beef, rocket and Parmesan; tagliatelle with speck and zucchini; sliced beef with rosemary; a side-dish of seasonal vegetables; fresh seasonal fruit salad with ice-cream; 1/4 liter wine and 1/2 liter mineral water. - The vegetarian menu includes: a starter of mixed cheese dish with jam; tagliolini with courgettes and cherry tomatoes; omelette; a side-dish of grilled vegetables; fresh seasonal fruit salad with ice-cream; 1/4 liter wine and 1/2 liter mineral water. Nota bene: despite the restaurant has the same name, it’s not managed by our Organization, but our staff carries out periodic checks on the food and service quality. Due to limited space on board, luggage boarding is allowed only after checking and online booking of it. The maximum expected size, for each piece of luggage, is the following: 75 x 50 x 30 cm. The price is € 20.00 for each luggage boarded. Any luggage greater than the expected measures will require the payment of another luggage. How to book: when booking the tour, in the "Select tickets" step you will be asked to insert the amount for each otpion you desire to book; please, enter the number of luggages that you want to take on board. In case that the number of luggages you desire to book should exceed the remaining availability, please contact us on info@ilburchiello.it: our staff will verify any additional availability and will reply you as soon as possible. The reservation is necessary for: suitcases, trolleys, large travel bags, big backpacks, travel bags or sport bags. The reservation is not necessary for: lady handbags, cameras, small backpacks. - Passengers must make their own boarding of their luggages, leaving them where indicated by our onboard Staff. - The boarding of undeclared luggage will be allowed only in case of available space on board and it will require the payment of the above mentioned fee plus an additional penalty of € 10.00. - The luggage's storage area is located inside the passenger cabin and it is not guarded. The Management accepts no responsibility for any theft or luggage tampering. • at our office by telephone or e-mail and paying by credit card. The balance should be paid online by credit card (VISA or Mastercard) upon our confirmation at the web site www.booking-on-line.com; if you have troubles with the direct online payment, please follow this link and retry by following the instructions; you may also call us and give us the debit authorization by telephone, e-mail or fax; please put the name of the credit card holder, card number, expiration date and the CVV (or CVV2)..
1. The travel contracts are regulated by the law n. 1084 of 27/12/1977 (CCV) and by the legislative decree 111/1995. The responsibility of the company can under no circumstance exceed the limits established by the above mentioned law. The acceptance of the reservation is subject to availability of seats and it is concluded with the confirmation of the reservation and the payment of the balance. 2. The Organizer reserves the right to modify or cancel the trip in case of force majeure. 3. The seats on the boat are not numbered and cannot be pre-booked. 4. As it is a travel package ruled by the Regional Law no. 33 of 04.11.2002, the reservation is mandatory. The reservation is to be considered valid only once the balance of the service has been paid. 5. The non-departure of the boats caused by technical reasons or force majeure causes, entitles the client to the sole refund of the amount paid for the cruise. The Organizer shall not be considered responsible for the unexpected closing of the villas and for any delay or interruption caused by problems with the opening operations of locks and bridges, subordinated to the public service or of unexpected closing ordinances. In case of unexpected closing of one Villa, an alternative Villa shall be visited. In case of interruptions of a part of the navigation itinerary, as a result of the provisions of a competent authority, the booked service can be completed by the Organizer using the bus. In case of interruption of navigation in the route Stra - Venice, for emergencies and/or orders of the competent authorities, the booked service can be completed by the Organizer using the bus, without the right to any refund. In case of interruption of navigation in the stretch Padua - Stra, for emergencies and/or orders of the competent authorities, the booked service will start or terminate in Stra without the right to any refund. In March and after the half of October, the visit of Villa Widmann won’t take place due to technical reasons and the price will remain the same. 6. The entrance fees to the Villas are complimentary services offered by our Organization: any change to the entrance fees will not entitle the Organization for any surcharge nor the client for any refund. In case of non-visit of a Villa for technical reasons or force majeure will not entitle the client for any refund. 7. The transport of animals is not allowed, unless they are kept in a pet carrier; the luggage transport is not allowed, unless for small hand luggage, allowed upon request; the use of any photo materials inside the Villas is not allowed. The Organizer shall not be responsible for any personal item left on board during the stops. • the entire travel amount in case of renunciation after that date or in case of no show. • the entire travel amount after that date or in case of no show. 10. For any dispute, the parties should refer to the Court of Padua. In case of conflicting interpretations, only the Italian version of the Terms & Conditions (“Condizioni generali per la prenotazione dei posti”) is considered legally valid.